These four Martyrs lived during the reign of Emperor Diocletian (284-305). They were very wealthy, holding the office of imperial senators. 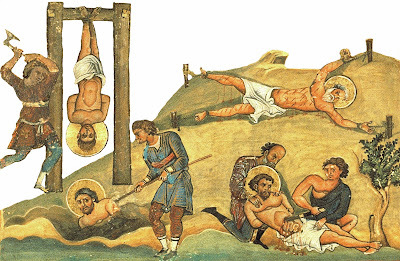 They came to faith in Christ, and received holy Baptism, after seeing Bishop Theopemptos of Nicomedia (Jan. 5) bravely endure the torments of the faithless, and working miracles by the power of Christ. Having been denounced to the emperor and standing before him, they first had their belts removed, a sign of their exalted office, then each received a different end to their life. Saint Bassus was cast inside a pit up to his thighs, and after his hands were cut off as well as his entire body, he came to an end. Saint Eusebius was suspended upside down, and being cut to pieces with an axe, he came to end. Saint Eutyches was violently stretched out to four stakes, and after being cut into three parts, he had a blessed end. Saint Basilides had his stomach ripped open with a knife, and his life came to an end. In this way all four received crowns of martyrdom.